What Does Watermelon, Cantaloupe and Honeydew Melon Have in Common? Aside having a lot of seeds, Watermelon, Cantaloupe and Honeydew melon are all low-sodium, low-calorie fruits that are fat-free and a best eaten at their peak of being ripe. These vine-grown delights are high in the one vitamin that we cannot seem get enough of naturally and yes, you are right...vitamin C! Vitamin C is well known for its cold protection properties, but it alone is not the end-all for a cold, and is one of those vitamins we just take for granted as being in the foods we eat. 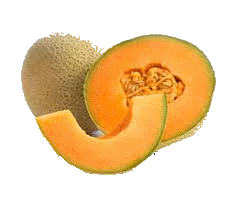 Melon with red and orange flesh is high in vitamin A. But, our intent for our melon page is not to inform you on how good they are for you, you already know that. What we want to convey here is how you can tell when they are perfectly ripe to eat. So, the key to serving up a perfect melon is making the selection at the peak of ripeness. But who knows when that is unless you are an avid gardener and have been wading knee deep in rich soil watching, touching and managing the micro-climate of the vine (been there, done that). So here are some quick and easy ways outside the garden to determine when that melon you are eyeing in the grocery store or fruit stand is just right for you. Watermelon - A fun food for all ages! Ripe watermelon is hard to the touch. 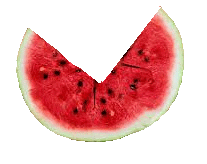 If the outside skin is soft to the touch or has wrinkles, the watermelon is starting to rot. Great for attracting insects and not necessarily safe to eat. So when you cut it open and find it overripe, it still may be safe to eat, but be very cautious. Ripe when they begin to soften and have a light cantaloupe fragrance. Now smelling the fragrance can be a challenge. Not everyone approves when you handle all the melons in the market, especially when you put your nose to them. But, you gotta do what you gotta do. Usually if a melon has no fragrance, the chances it will ripen properly is slim. However, I have had some success picking cantaloupe without a smell to them. I combined the honeydew method of selecting a decent melon as opposed to garnering the fragrance. Honeydew selection is quite a bit easier to do. Your hearing has to be good though, so if you are going deaf, get a hearing aid because not being able to hear a very soft rattle when you shake them near your ear will work against you. 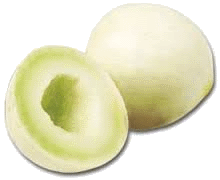 The seeds will rattle as they loosen from the inner flesh of a juicy honeydew. And when you hear the rattle, you know this melon is perfect for eating. Shaking the melon in the market is a bit unnerving when you have shoppers standing by. But don't worry, a honeydew is perfect to eat when you can hear the seeds rattling around when you shake it near your ear. That's it! Melon class 101 is complete. Now go get the ripe ones! Get that melon baller you've been looking for!